Plain radiographs are a widely available modality that confer benefits of cost effectiveness and promptness, proving them very useful as an initial diagnostic choice when approaching several musculoskeletal concerns, particularly pelvic and hip pathologies. Pelvic and hip X-rays are almost always obtained, and with good reason, in patients presenting after significant blunt trauma to rule out bony abnormalities and underlying structural injuries in patients that are unstable or altered, have an abnormal pelvic exam, or have significant distracting injuries. 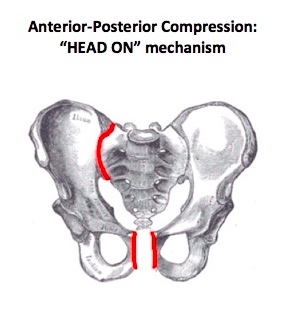 While it is vital to have a high suspicion for pelvic injuries in high mechanism traumas, continue to have high concern in low energy traumas as well, especially in patients prone to pelvic injury due to underlying pathophysiology, such as the elderly or bone composition deficiencies, as they can lead to high morbidity if not diagnosed early in the course of illness. Pelvic and hip X-rays are most frequently obtained when there is concern for fracture, joint dislocation and effusion, and several pediatric pathologies involving the pelvic girdle which are outlined below. Before delving into the radiographic approach to pelvic and hip X-rays, let us first review some anatomy. Please review Dr. Goel’s excellent post on Pelvic X-rays that provides an excellent review on anatomy and overview on basic radiographic approach. Pelvic and hip anterior-posterior (AP) and lateral images are most commonly obtained when assessing for pelvic bony abnormalities as many physicians have greater familiarity with interpreting these particular views. However, there are other radiographic views that can provide a more holistic view of the patient’s anatomy, allowing physicians to better visualize occult fractures that are uniquely displaced and that may not appear on the AP or lateral views. Please note that the more views that are obtained of a bone or joint, the higher the sensivity and specificity of plain radiographic imaging becomes in detecting bony abnormalities. There is no one correct way in approaching a plain radiographic imaging of the pelvis or hip; however, ensure that you find an approach that allows you to evaluate each and every image in a methodical manner so as not to miss any lesions! Since I am a foodie at heart, I have chosen the mnemonic PB & JS to highlight my love of all things peanut butter and jelly. 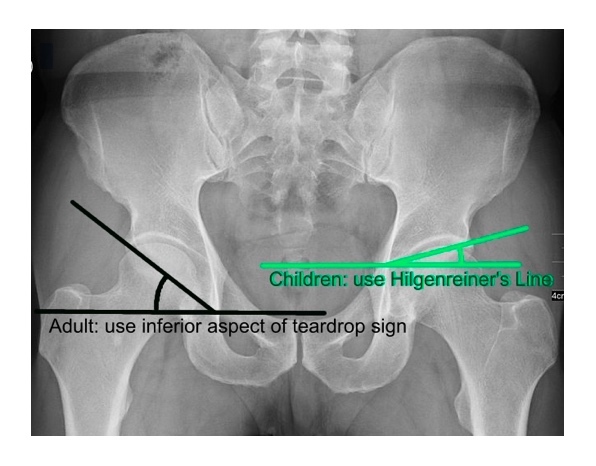 Measurement taken from Hilgenreiner’s line (prior to ossification) in children vs. inferior margin of teardrop sign (after ossification) in adults. 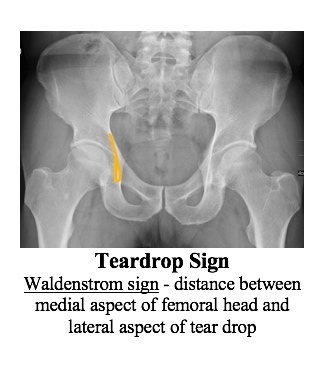 If femoral head is superolateral to joint space and appears smaller than contralateral femoral head, it indicates a posterior dislocation; the majority of dislocations are posterior dislocations and they can lead to sciatic nerve damage. If femoral head is inferomedial to joint space and appears larger than contralateral femoral head, it indicates an anterior dislocation; anterior dislocations can damage the femoral nerve and artery. 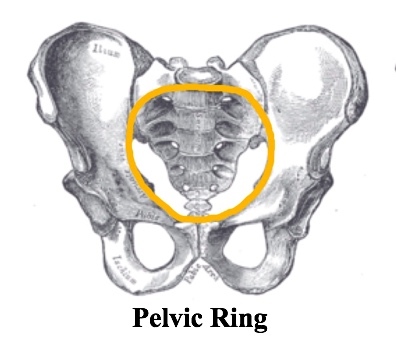 Because the pelvis is a ring-like structure, be wary that a fracture in one part of the ring is often accompanied by damage to bone, ligament or tendon structures at some other point in the structure. Usually low-energy fractures have only one break in the ring, and there is usually maintained alignment of the broken ends. In this case, there is low likelihood of the bones dislocating abruptly and causing damage to underlying structures, in which case these are considered stable pelvic fractures. These fractures can usually be managed non-operatively. Clinical history: insidious onset in atraumatic hip, and patient presents with thigh or knee pain, or limp. Pain worsens with activity and is relieved by rest. Treatment: The younger the patient, the better the diagnosis. There are non-operative versus operative nuances, but in general, younger patients are non-operative with conservative management such as non-weight bearing and prescription of NSAIDs with referral to physical therapy. Campbell, SE. 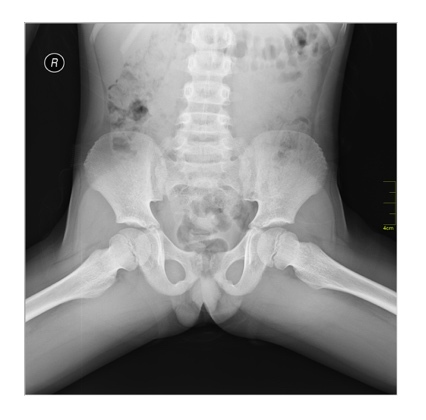 “Radiography of the hip: lines, signs and patterns of disease.” Seminars in Roentgenology. 2005 Jul; 40(3): 290–319. “Chapter 6: Basic Approach to Hip/Pelvis X-Ray.” Emergency Medicine Images for Practice: An Overview of X-Ray, Ultrasound, CT, and MRI Images, by Mari Baker. Chiamil, Sara Muñoz, and Claudia Astudillo Abarca. “Imaging of the Hip: A Systematic Approach to the Young Adult Hip.” Muscles, Ligaments and Tendons Journal 6.3 (2016): 265–280. PMC. Clohisy JC, Carlisle JC, Beaulé PE, et al. A Systematic Approach to the Plain Radiographic Evaluation of the Young Adult Hip. The Journal of Bone and Joint Surgery American volume. 2008;90(Suppl 4):47-66. doi:10.2106/JBJS.H.00756. Khurana B, Sheehan SE, Sodickson AD, Weaver MJ. “Pelvic Ring Fractures: What the Orthopedic Surgeon Wants to Know.” RSNARadiographics. 2014 Oct.
Lim, Seung-Jae, and Yoon-Soo Park. “Plain Radiography of the Hip: A Review of Radiographic Techniques and Image Features.” Hip & Pelvis 27.3 (2015): 125–134. PMC.